Seven hundred first responders, including troops from the Massachusetts National Guard and members of regional technical rescue teams, were at Camp Edward to partake in a huge drill to prepare them for a variety of mass casualty events. They didn't know the victim was there. 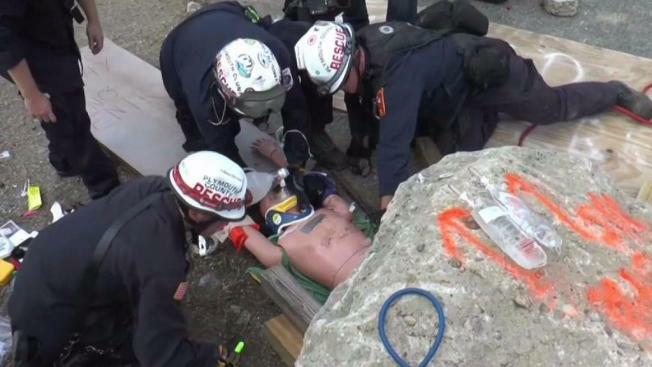 But as the Plymouth County Technical Rescue Team rounded a devastating mound of rubble, they found him — trapped under a slab of concrete. The team scrambled to stabilize him and figure out how to get the concrete off without injuring him further. "We just need an inch," said Steve Silva who doubles as a paramedic for the fire department in Middleboro, Massachusetts. "We only need an inch." The team was responding to a fictional terrorist attack — a car bomb outside a town hall meeting. The drill is one of the largest the state has seen, with 700 first responders training for mass casualty events at Camp Edwards. Half are Massachusetts National Guard troops, half are members of the state's elite regional technical rescue teams. "Tech rescue teams are called in when the local fire department can't handle — they don't have the resources, they don't have the manpower or they don't have the equipment," said PCTRT member and Hingham Firefighter Mark Durling. This day, the teams test their equipment and skills in situations that once seemed impossibilities. "It is real for us," said First Lieutenant Tiffany Medeiros with the Massachusetts National Guard. "We are a no-notice mission. We get the call and we move out. It's not if. It's when." The real world leaked into the drill as news of Friday morning's London subway bomb spread. Pat Travers calls it a sign of the times. The Whitman firefighter says his department was just issued bulletproof vests. "As a firefighter-paramedic, I never thought that I would have to wear a ballistic vest on a call," he said. "But we do. It's a different world." A yellow lab and her handler scuttle across the parking lot. Pak and firefighter Andrew Solden are with the Norfolk County Technical Rescue Team. The pair recently joined the state FEMA team, as well. "This training lets her work with people around her," said Solden. "All the noises — real life experience." Pak's job is to sniff out victims who are still alive. She alerts, and two survivors crawl out of dusty crevices in the collapsed building. "Two for two," said Solden. "That's a good day." 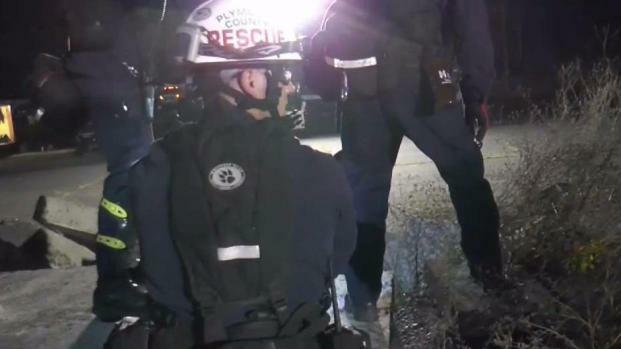 Hundreds of first responders took part in one of the biggest mass casualty drills in state history. In this 72-hour drill that started Friday night, teams have no idea what their assignment will be and are thrown curveballs — the radio failed, victims are belligerent, the structure's failing — a storm is moving in. "We're thinking on the run," said Silva. "There are time delays. There are challenges." "It helps us step up our game," added Travers. That game is not only for terrorist attacks or natural disasters. These firefighters and their training pivot to the more mundane, but no less devastating, such as car crashes, trench collapses or construction accidents, on a dime. "It gives the public a great advantage [to survive], as well," Silva said. The drill is funded largely by federal homeland security grants. It continues through Saturday.